Sound of The Heart is a companion novel to Genevieve Graham’s debut release, Under The Same Sky. The books focus on the separate adventures of two brothers who believe the other was lost at the Battle of Culloden. In Under The Same Sky, readers are introduced to Dougal MacDonnell, Andrew’s brother who is believed to have died in battle. It is later revealed in Sound of The Heart that Dougal is in fact still alive and is an incredible warrior. Dougal and his family are Highlanders in Scotland, and while trying to save their home land from the crown, Dougal is captured by the British. Unfortunately back home, there are not many survivors. Along with the help of those who have befriended Dougal, the men devise a plan to escape their captors. Once going over all the details, there is only one issue that is left in the minds of those involved… What will happen to the men after they gain their freedom? At the risk of revealing too much of the story, I will just quickly mention that there is a female character named Glenna that plays a primary role along with Dougal in this historical fiction novel. Although the novel’s synopsis gives you a little hint as to what to expect, you will all just have to read the novel yourselves to find out more about the relationship between these two characters *winks*! My favorite aspects of the novel were the underlying meanings of the storyline. Sound of The Heart is about finding strength in moments of despair and never giving up without a fight. The characters showed a tremendous amount of bravery, honesty, and passion. They were engaging throughout the novel and every character played an important role and even if they only appeared on a few pages, they stand out and will leave a long-lasting impression on readers. I also enjoyed how the novel was split into parts and had alternating point of views between the two main characters. With a rich flair of history and a great deal of romance, readers will once again fall in love with Genevieve Graham’s second novel, Sound of The Heart. I am definitely looking forward to reading more from this fantastic author. 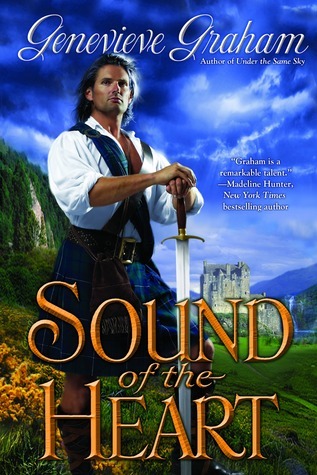 I recommend Sound of The Heart to those who enjoy Historical Romance and Adult Fiction titles.